Here I will explain how to solve the problem of “Visual Studio TFS Key Not Valid for Use in Specified State” while connecting tfs in visual studio. This key not valid for use in specified state problem occurred due to changing some login key values. In previous posts I explained convert string to lower case, upper case and title case in asp.net, jQuery send receive json object from webservice methods, Asp.net mvc complete project with database, download multiple files as zip folder in asp.net and many articles relating to solve errors in asp.net, SQL Server, IIS, etc. Now I will explain how to solve the problem of “key not valid for use in specified state” in visual studio while connecting tfs. 2. 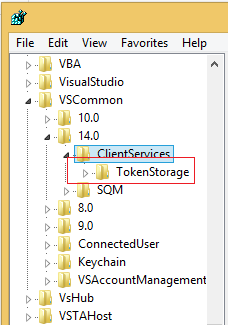 Type regedit in search and open it then navigate to TokenStorage folder by using following path. Now delete this folder and try to open your application in tfs it will ask for login just login again it will fix your problem.